At Trading College, we have coached and mentored people from many walks of life and yes, you can become someone who can continually take profits from the markets every month. Trading College coaches are experts in taking someone who knows little about trading and giving them the tools and education to succeed. However, you’re going to need to understand how professional traders think. Professional traders have a different mindset than the get rich quick type. Professional traders are confident in their own ability to generate consistent profits. We need to teach you the same skills. We know trading is a confidence business so if you’re making winning profitable trades, your confidence is going to grow. You’re going to then enjoy your trading instead of struggling and consistently getting frustrated. We will hold your hand until you have the confidence to trade all by yourself. Having the confidence to do this forever is what all our students strive for. We will give you the skills, education and support to give you the best chance of success. To go down this route alone would be tough. This is just not necessary as we are right here to help succeed. *NEW* If you become a Trading College Group Mentorship Student there will be no need to search for trades as we will install our screeners on your charts and PC for every one of our strategies. 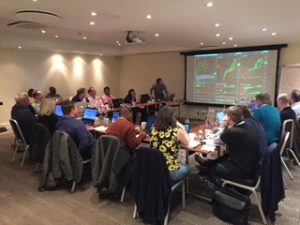 Ultimate Trading Programme – 8 week online tutor delivered course on our Professional Trading System, includes software, 3 indicators (StoryTeller, OBS and MACD), pre course PC set up, access to brand new training portal. 10 group days per year. Join your fellow traders for interaction and an additional live trading day. I love trading, and being a member of the Trading College has opened up a whole new life for me. Everyone within the Trading College Team is so friendly and helpful and I have met some really nice people through the programme. Lee is an amazing teacher, patient, funny and more importantly approachable! As I work full time for Lloyds I cannot Day trade only Swing Trade. I decided to go to the next level and invest in the Mentorship programme which has really blown me away with the educational content, support and just awesome strategies that really is priceless. Lee gives so much time and effort to helping me become a better trader. In the Mentorship programme I have just finished the Base course and this alone has changed the way I think and trade that I finished recently with one week taking 500+ pips out the market. I was not a confident trader before joining Trading College however now I am not only confident every time I put a trade on but I am now a consistently making profits into the 90pct winning trades.Lee’s teaching is honest, supportive and tailored to the individual rather than the masses. His Company Trading College is the best College out there and is incredibly great value for money if you are serious about Trading.